If you don't know what I'm talking about, lemmie quickly 'splain. Sarah at Saturday Sequins proposed a challenge of sorts. 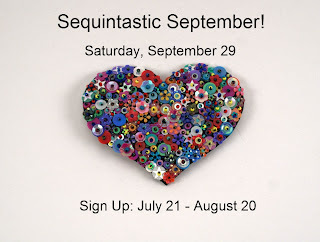 Basically, make something with sequins, share the photos today, and express a little on your thoughts about sequins. She even created a Sequin Inspiration Pintrest Board. I started thinking about this challenge long before I actually started making anything. I made a list of ideas and pulled out my tub of sequins. Yes, TUB OF SEQUINS! I don't know what it is that draws me to them. The sparkles, the variety of sizes and shapes, the holes that make them rather bead-like. It's a complete mystery to me. Yet I've picked up sequins at thrift stores and yard sales, family and friends have given them to me, I've even gone to the craft store and bought some of them new. It's a problem really. With a baggie of multi-colored sequins, some gold beads, and some gold memory wire; this bracelet came into being rather quickly. I only know how to do a simple crochet chain stitch and not well at that. However, these two necklaces didn't turn out too shabby. Both of them can also be wrapped several times around the wrist for some really fun bling. This was the bracelet design I mentioned in a previous post. The tutorial for this Easy Sequin Bracelet is at Quiet Lion Creations. I altered the design some by adding the layer of sequins to the front and back. Here were have probably my most favorite design in the bunch. . .a Kumihimo sequin and bead bracelet. I really love the confetti-like sequins in this piece. I'm still not sure about the clasp, but I'll work on it later. These earrings were quickly thrown together. They're just hoops, sequins, and some seed beads to separate the sequins. 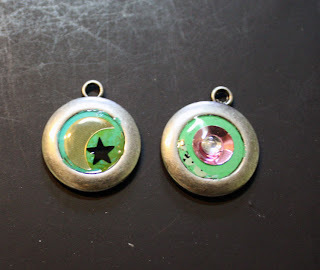 These were my last sequin project, but one of the first ones I knew I wanted to try. . .sequins in resin! I even got to try out two products I hadn't used yet: Vintaj Patinas and Magic-Glos. The left charm is patina and no-hole sequins and the right charm is patina with a sequin, rhinestone, and a bit of paper. I'm not sure where there will end up yet. I'm happy that I was able to come up with so many ideas for the sequins. I know none are super impressive and I didn't really make a dent in the stash, but I cannot wait to see what the other participants come up with. It's hard to express my feelings about sequins. I've already mentioned that I've been hoarding these for ages and am so pleased that I was able to come up with some projects to use some of them. 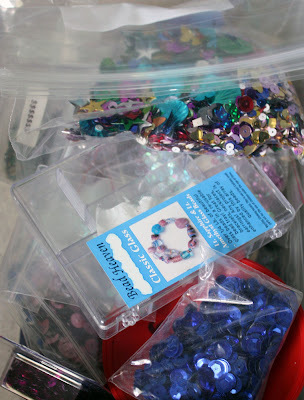 To me sequins are a craft staple. . .like glitter. It's one of those things that was always stashed in mom's craft supplies. However, there's also something so elegant about sequins. Living just outside the birthplace of Mardi Gras, I see a ton of sequins as the maskers ride on the floats and as the ladies are dressed in their finest. Like confetti or champagne, sequins are usually brought out in times of celebration and revelry. However, the designs I've made above show that sequins can be worn everyday for just a little extra sparkle in your life. Now, you head off and check out what the other participants of the Sequintastic September Challenge including the hostess Sarah. I appreciate you taking the time to take in my sparkles! Now I'm itching to try sequins and crochet. They look so delicate and elegant together! Thank you for participating! I might hold another blog hop in April, and if it happens, you're more than welcome to join in that one. OMG! This are spectacular! You really went to town, downtown, down to sparkle town. I LOVE all of them. Sparkle on! Oh, my goodness, Hope!! Your pieces are gorgeous! 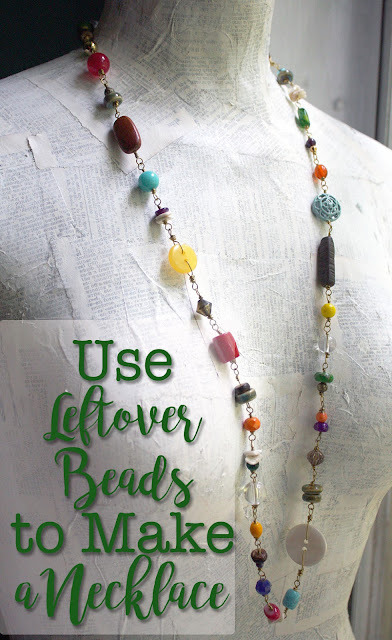 I love all of them and I think your crocheted necklaces are fantastic! The kumihimo one is beautiful. Your stash of sequins beats mine and I thought I had a lot :)! "None are super impressive" Are you kidding right? I am in love wit the memory wire bracelet. It looks so tribal and gives sequins a new definition. And the two little pendants are soooooooo nice!!! I think you have done a great job! Girl your knocked it out of the park on these creations! I love each and everyone. My favorite is also the Kumihimo bracelet, and the memory wire bracelet comes in second favorite. Beautiuful, beautiful work my friend! Holy smokes! look at you go girl! I really, really love the wrap bracelet - that is freak'n awesome! now I want to try it! I might even buy more sequins just to make that! Ambra- I was just thinking about all the items Sarah had on the Pintrest board and how intensive most of them were. Mine were not labor-intensive by any means, they were all just quick and easy projects. I really like the stacked look of the sequins in the memory wire bracelet too. I'll definitely be making more of those. Thank you for the confidence boost as well! Cynthia- Buy more sequins. . .it really takes less than you think. Of course, I didn't count the sequins so I could be mistaken. Have fun with it. I actually just came up with a similar idea to that one that I might have to try later. Anyway, Thanks! Gorgeous sequin creations! My faves are the bracelet with coloured sequins in silver sequins, the crochet and the memory wire bracelet (stringing the sequins like that almost make them look like striped beads). Fab job! Nice work! 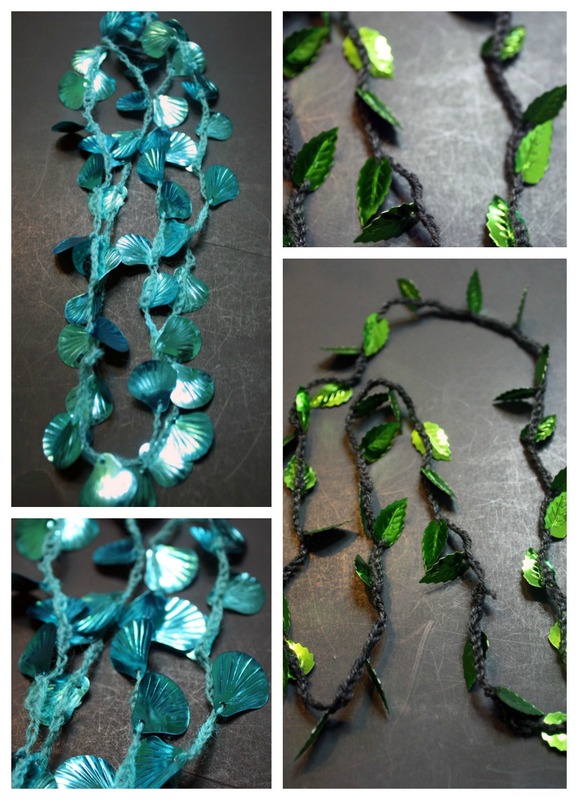 I love the seashell necklace and the leaf one as well. Look at you go! Whew! Okay, your sequin fever is contagious... I like the resin pieces. You really went to town. I to have draws of sequins and love to use them. Your projects are great! Robyn- Thank you so much. Yeah, I went a little crazy with the ideas. There were just somany of them and I'm trying to actually MAKE some of the things that I come up with! I'm glad it worked out :) Thank you for popping in! The fact that you have a tub 'o sequins means that you were MEANT to be part of this hop, and boy howdy, did you step up! I was going to say that the kumihimo bracelet was my favorite, but there's something so fabulous about those resin pieces, I can't get them out of my mind. Wow!! Awesome pieces, you really did the sequins justice! Love the tub of sequins.. I like the green leaf crochet... great job. So stinkin' jealous of your creativity! You absolutely rocked those sequins!! Love the memory wire bracelet, that's just brilliant. I think my fav has to be the kumihimo one, since that's my latest passion. You did such an awesome job!!! What an amazing variety of projects, and I love them all. 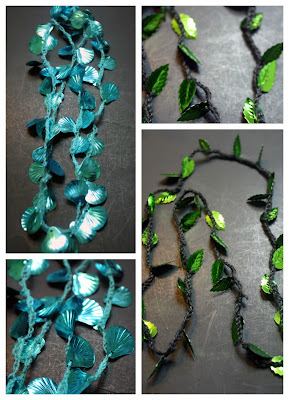 I think my favourites may be the crochet necklaces - one for a mermaid and one for a dryad. Hope, everything you made is fantastic! I am particularly in love with the memory wire bracelet. I just love how they look all nestled into each other like that. You made so many great pieces!! Love the Kumihimo, but could see wearing all of them!! Boy howdy you DID make a lot!! I just LOVE that Kumihimo bracelet- that is amazing! I love all of the creative ways you used the sequins (you do have quite the variety and collection!) Beautiful work, Hope! Erin- Yeah, I went overboard with the sequins. I had so many ideas written down for them that I was determined to get to all of them. 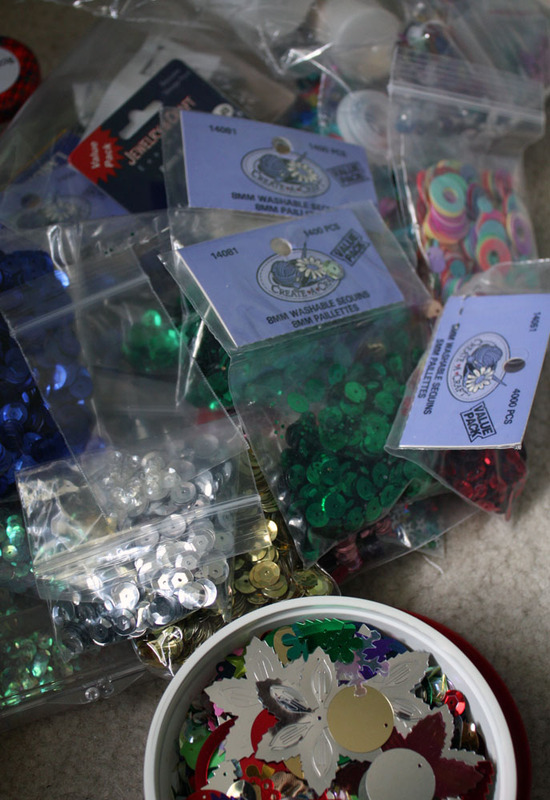 Unfortunately I didn't make much of a dent in that stash of sequins. I guess I need to come up with some other ideas now!! I love the bracelets you made! they are realy cute and I love the colors! 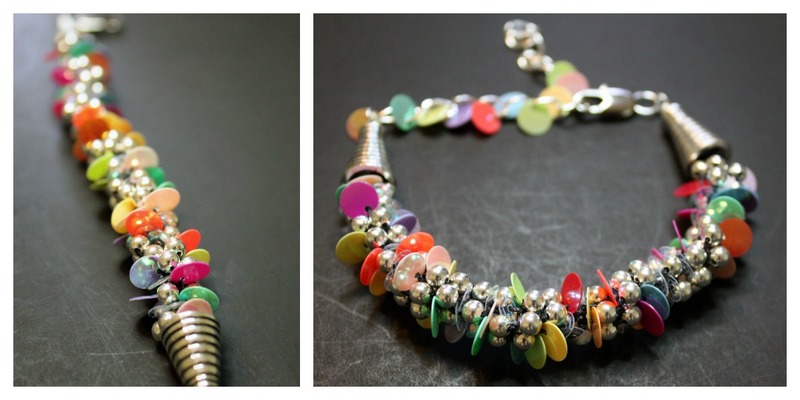 WOW, I love them all Miss Crafty Hope, but the first memory wire bracelet is killer!